I have checked that documentation already but I still don’t see how I should achieve my goal. Just posting a link to a a documentation page is not very (user) friendly imho. If you can help with the specific problem, please do. But if you don’t want to or cannot, don’t just post to post… I know LMGTFY or RTFM but if that still is not clear enough for me to understand, isn’t that what asking for help or a forum is meant for? The information below allows you to determine which Item states are persisted, when they are persisted, and where they are stored. The persistence of an Item’s state may be triggered when that Item changes state or when the Item is updated (even if its state did not change). Persistence may also be triggered by a time-related event (see Cron Persistence Triggers below). openHAB uses Quartz for time-related cron events. See the Rules article for more information. * Each line in this section defines for which Item(s) which strategy(ies) should be applied. * Item (excl. the group Item itself). Everything I would have typed in to answer your question are right there in the documents. So I could have spent 10 minutes retyping the exact same thing that is in the docs already, or I could point you to the part of the docs that gives you the exact answer to your question and spend that 10 minutes helping someone who has a question that isn’t already pretty fully documented. I’ve bolded the most important text and added // <------ to point to the lines in the comprehensive example that specifically answer your exact question. Just posting a link to a a documentation page is not very (user) friendly imho. Just asking a basic question without showing any indication that you have even looked at the docs, done a search of the forum, or even looked at the example in the OP, shows a lack of respect for the time of the volunteers spend on this forum trying to help users, IMHO. If you DID look at the docs before posting your question, then say so in your original question. Explain what your confusion is and where the docs are not clear. Then we can actually fix the docs to make them more clear. We don’t have enough volunteers here to spend hours and hours rewriting the docs as a reply every time a user asks a question whose answer is in docs. everyMinute : "0 * * ? 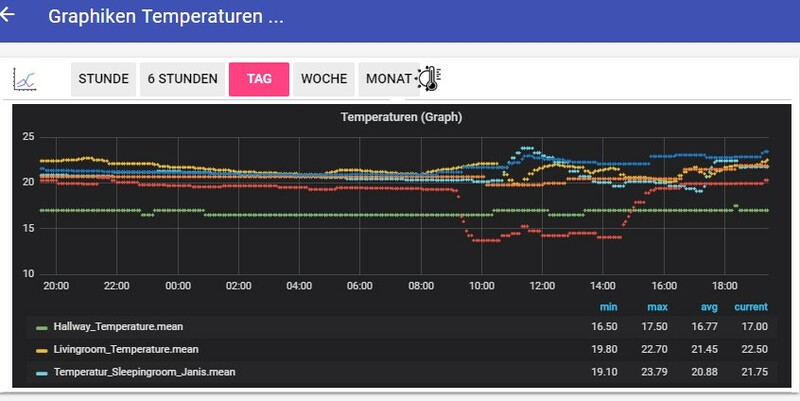 * *"
Raspberry PI is now officialy supported so I switched to the official repo instead of https://github.com/fg2it/grafana-on-raspberry. When doing so, anonymous access was not working. I don’t remember when the org name is set, but you can find it in the grafana settings, under server admin menu. 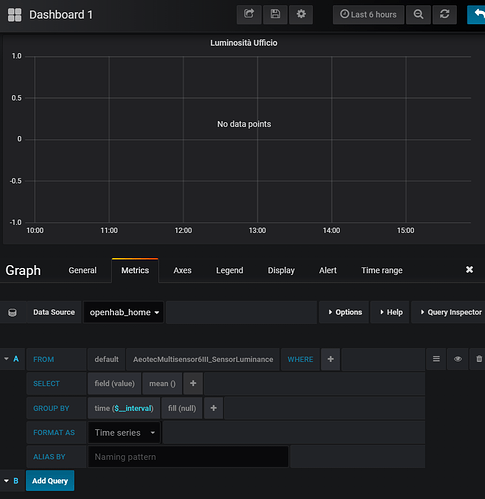 Also: On the PC I have also to login into Grafana to see the graph, is there a “good” way that this not needed? The persistence for InfluxDB does impose some limitations: you can’t use the tags and the multiple values and different retention policies in InfluxDB. For example, you could have a measurement “Temperature” and the tags “Inside” and “Outside”. Or maybe you want some measurements saved forever and others for much less time. You can use continuous queries to down sample, but it doesn’t cover every case. Also, you can have a measurement “SensorValues” with values such as Temperature and Humidity all within that measurement. Fortunately there is quite an easy workaround with the HTTP post request. I’ve put a sample below for anyone who is interested. If you’ve used the authentication above, you’ll need to add it to the http val. And of course modify it to your liking. I use a timer to not bog down the rules when the post request is running. 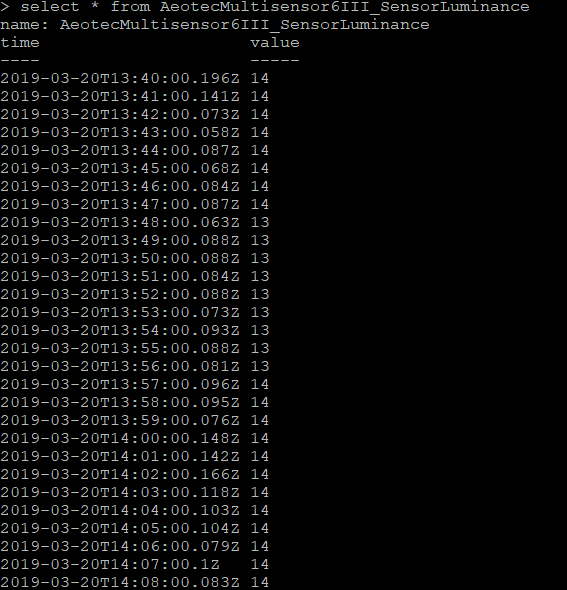 val String INFLUXDB_WRITE = "http://192.168.86.212:8086/write?db=openhab_db&rp=autogen"
Time cron "0 0 20 ? * MON-FRI *"
Persistence: Possible to specify both time and value with postUpdate? I want to implement a “Direct Link Rendered Image” into my Habpanel. Problem is, that the background is black from the dark theme or white from the light theme. In the thread of the matrix theme I saw that it should be possible to create a css file, which I have to implement into the index.html file under directly below the title tag. I did this, but without success. Is there somebody who solved this? In Installed influxdb and grafana according to the describtion above, version 1.0.2. was installed (using an Pi 3+). But i cannot go to the command line interface? When I run influx, the answer is command not found. 8888888 .d888 888 8888888b. 888888b. 888 88888b. 888888 888 888 888 888 888 888 888 8888888K. but why cant i go to the cli? I would try this. 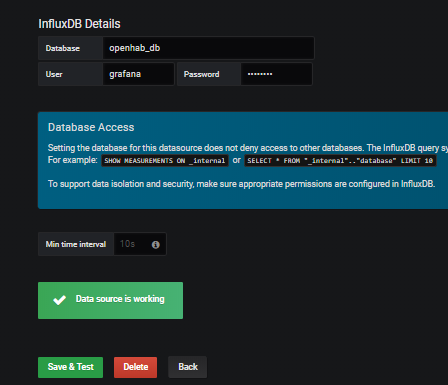 I recently installed influxdb and got only the server and not the client on Ubuntu 18.04 server. Perhaps they have separated the server and the client in the latest package. Port 8083 for admin can work, but you need to enable it first in the influxdb.conf file in the admin section as the default is disabled. Also, it says that the interface is deprecated and will be removed in a future release. I measure few temperatures, store the values every 5 minutes in an influxdb. Now, the graph for 1 day (or less) view has “steps” because of less values. But is there an option that Grafana interpolate (create a curve betwen the point) and the graph looks “smoother” ? When activating additionally “To the right”, than all six values are shown on the right part from the screen (but than the graph is to much shrinked). Is this a limitation, a Bug or a mistake on my side? For the first question, select “connected” for the null value in the Display tab in Grafana. There’s a picture here. When moving over on the right part, a scroll line appear! Without move-over there is NO hint that there are more lines! But in my case it would bether to see all 6 lines directly, is there an option? I’m sure the issue will be obvious to someone, i can’t seem to put my finger on it. I confess i ventured into installing InfluxDB and Grafana from the openhabian-config>optional components installation ( i thought: “it’s been 2 years ever since Thomas Dietrich wrote this tutorial, let’s be brave!” - btw the tutorial is definitely still relevant, so TY). The automated setup process sets up most of the things for you, basically all there is left is to install the addon in paperui and schedule a persistence job. i don’t get any result, except for a “no data points” written in the middle of the graph. I’m sure i missed something silly (as usual for any first timer the amount of info can be overwhelming). EDIT: do i need to write SELECT * FROM … so influxdb CLI commands in the grafana query for it to work?? May i ask how did you achieve this? I’m guyessing you’re feeding system stats to influxdb from somwhere…? I’m not sure if I understand the question, but I basically just store values from Systeminfo Binding via influxdb persistance. didnt’ explore systeminfo yet, was checking nmon from time to time. now with grafana makes a lot more sense. How can i update Grafana? I’m on 5.1.4 - according to the grafana homepage there’s 6.0 available.